I come back to the idea from the post Click and zip with bacterial conjugation , with a bit more details. It is strange, maybe, but perhaps is less strange than many other ideas circulating on the Net around brains and consciousness. The thing is that bacteria can’t act based on semantics, they are more stupid than us. They have physical or chemical mechanisms which obviate the need to use semantics filters. Bacteria are more simpler than brains, of course, but the discussion is relevant to brains as collections of cells. The idea: bacterial conjugation is a form of beta reduction! On one side we have a biological phenomenon, bacterial conjugation. On the other side we have a logic world concept, beta reduction, which is the engine that moves lambda calculus, one of the two pillars of computation. What is the relation between semantics, bacterial conjugation and beta reduction? Lambda calculus is a rewrite system, with the main rewrite being beta reduction. A rewrite system, basically, says that whenever you see a certain pattern in front of you then you can replace this pattern by another. Graphic lambda calculus is a graph rewrite system which is more general than lambda calculus. A graph rewrite system is like a rewrite system which used graphs instead of lines of text, or words. If you see certain graphical patterns then you can replace them by others. Suppose that Nature uses (graphical) rewrite systems in the biological realm, for example suppose that bacteria interactions can be modeled by a graph rewrite system. 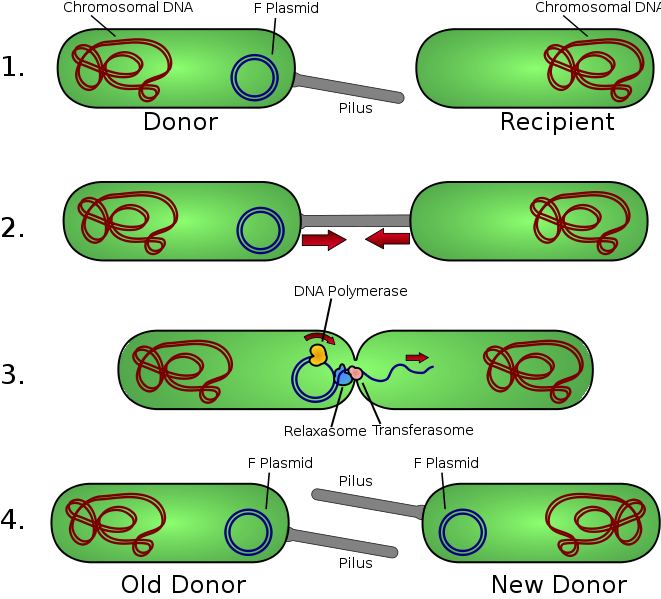 Then, there has to be a mechanism which replaces the recognition of pattern which involves two bacteria in interaction. When two bacteria interact there are at least two ingredients: spatial proximity (SP) and chemical interaction (CI). SP is something we can describe and think about easily, but from the point of view of a microbe our easy description is void. Indeed, two bacteria in SP can’t be described as pairs of coordinate numbers which are numerically close, unless if each of the microbes has an internal representation of a coordinate system, which is stupid to suppose. Moreover, I think is too much to suppose that each microbe has an internal representation of itself and of it’s neighbouring microbes. This is a kind of a bacterial cartesian theater. You see, even trying to describe what could be SP for a pair of bacteria does not make much sense. CI happens when SP is satisfied (i.e. for bacteria in spatial proximity). There is of course a lot of randomness into this, which has to be taken into account, but it does not replace the fact that SP is something hard to make sense from the pov of bacteria. In Distributed GLC we think about bacteria as actors (and not agents) and about SP as connections between actors. Those connections between actors change in a local, asynchronous way, during the CI (which is the proper graph rewrite, after the pattern between two actors in SP is identified). In this view, SP between actors, this mysterious almost philosophical relation which is forced upon us after we renounce at the God eye point of view, is described as an edge in the actors diagram. Such an edge, in Distributed GLC, it is always related to an oriented edge (arrow) in the GLC (or chemlambda) graph which is doing the actual computation. Therefore, we see that arrows in GLC or chemlambda graphs (may) have more interpretation than being chemical bonds in (artificial) chemistry molecules. Actually, this is very nice, but hard to grasp: there is no difference between CI and SP! Now, according to the hypothesis from this post and from the previous one, the mechanism which is used by bacteria for graph rewrite is to grow pili. The following image (done with the tools I have access to right now) explains more clearly how bacterial conjugation may be (graphic) beta reduction. In the upper part of the figure we see the lambda abstraction node (red) and the application node (green) as encoded by crossings. They are strange crossings, see the post Zipper logic and knot diagrams . Here the crossings are representing with a half of the upper passing thread half-erased. Now, suppose that the lambda node is (or is managed by) a bacterial cell and that the application node is (managed by) anther bacterium cell. The fact that they are in SP is represented in the first line under the blue separation line in the picture. At the left of the first row (under the blue horizontal line) , SP is represented by the arrow which goes from the lambda node (of the bacterium at left) and the application node (of the bacterium at right). At the right of the first row, this SP arrow is represented as the upper arc which connects the two crossings. Now the process of pattern recognition begin. In Nature, that is asymmetric: one of the bacterial cells grow a pilus. In this diagrammatic representation, things are symmetric (maybe a weakness of the description). 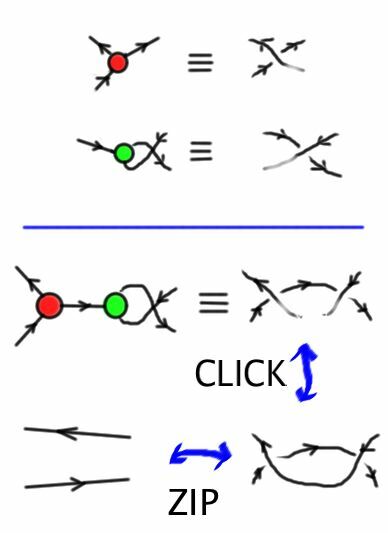 The pilus growth is represented as the CLICK move. This brings us to the last row of the image. Once the pattern is recognized (or in place) the graph reduction may happen by the ZIP move. In the crossing diagram this is represented by a R2 move, which itself is one of the ways to represent (graphic) beta moves. Remark that in this process we have two arcs: the upper arc from the RHS crossing diagram (i.e the arc which represents the SP) and the lower arc appeared after the CLICK move (i.e. the pilus connecting the two bacteria). After the ZIP move the arc which represents SP is representing a pilus as well!